The holidays are a joyous but hectic time, throwing any semblance of our usual schedule or order out the window. And if you are in the midst of a training plan for an early spring race, staying on schedule can be quite the challenge. 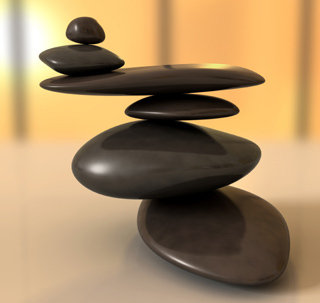 It can be a balancing act to take care of yourself, as well as prepare and enjoy all the holiday activities. “Stand up straight”, “pull your shoulders back”, “stick your chest out”, “don’t slouch”. We have all heard these commands to improve our posture. Although well meaning, more often than not, people, whether young or old, runner or walker, people don’t know where their bodies are in space (proprioception) or don’t have the appropriate structural alignment or muscular balance in order to attain good posture. To find balance, you need to know how to attain good posture by engaging your muscles appropriately for your particular structural alignment. This postural understanding needs to be engaged in any position or activity, such as sitting, standing, walking, running, doing the dishes, etc. Improving your posture and balance during this holiday season will you prepare for all of the fluctuations in your usual schedule. The drop down line through the top of the head, the ear, shoulder, hip, knee, and ankle shows the ideal alignment of the body. Any deviation forward or backward of the line demonstrates a possible biomechanical dysfunction or muscle imbalance. Stand sideways to a mirror in order to check your postural alignment. Remember, nobody is perfect, so expect to see some deviation. Regardless of what your posture currently looks like or how active you are, the following exercises will help you engage the appropriate muscles in order to stabilize you as you move through your day or activities. 2. Place your hand on your mid chest (sternum), apply gentle pressure to lower your chest, thus relaxing your shoulders. If you were used to sticking your chest out then this new position will feel like you are slouching. Check yourself in the mirror. 3. Feet: stand with your feet together, notice what part of your feet you are standing on, are you more on your heels, on the outside of your feet, on your toes or on the inside of your feet? Rock forward and backward from your ankles; notice as you have more pressure on your forefoot as you slow down so you don’t raise up on your toes; then rock back on your heels and don’t allow your toes to lift up. Continue rocking forward and back until you find a sweet spot where you are standing on your whole foot. Here are some basic and advanced balance exercises that can be easily performed throughout your day. In fact, I do many of the single leg stance exercises while standing in the checkout line at the grocery store. Make sure to have lower abdominals engaged when doing all balance exercises. Have a wonderful and safe holiday season. 1. Feet together, arms across chest. 5. Single-leg stance – do as often as possible throughout your day, particularly while doing activities such as brushing your teeth, shaving, preparing a meal, using the copier, while standing in line at the store. I came to Denise with pain in my neck and upper back from a fall earlier this year. In addition, I also have chronic low back pain. Denise evaluated me and went right to work giving me exercises and hands on therapy to help me. Today is my eighth session and I am happy to report that my back pain has been relieved and my neck pain is slight and so much better.